Petra “Rose City” a historical and archaeological city in southern Jordan situated between the Red Sea and Dead Sea. Walking through the gigantic red canyon and vast mausoleums surrounded by mountains riddled with passages and gorges. Inhabited since prehistoric times, this Nabataean caravan-city is famous for its rock-cut architecture and conduit system reached on the edges of the Wadi Araba desert – proof of once being a large luxurious metropolis in the Middle East. So what makes this place one of the wonders of the world? For one, it is magnificently half-built and half-carved into the rock, sketched on a natural stone backdrop that changes colour every hour such a work of art! Interested to know more? Let’s dig in deeper with the facts that RDV Voyage has simplified for you. There are over thousands of tourists are expected to visit every year at the UNESCO WORLD HERITAGE SITE in Petra. Established in 312 BC, representing one of the oldest metropolises in the world serves as a capital city for Nabataeans. This was later on abandoned. In 1812, it was again discovered by Johann Ludwig Burckhardt, a Swiss explorer, then later on called as “Lost City”. It is among the world’s most famed archaeological sites with around 800 carved tombs, monuments, sacred structures, arched gateways and colonnaded courts were its most carved from kaleidoscopic sandstone, granted as “Royal Tombs”. The Petra theatre can seat between 5,000 to 8,000 people. It consists of three horizontal sections of seats separated by passageways and seven stairways to ascend. 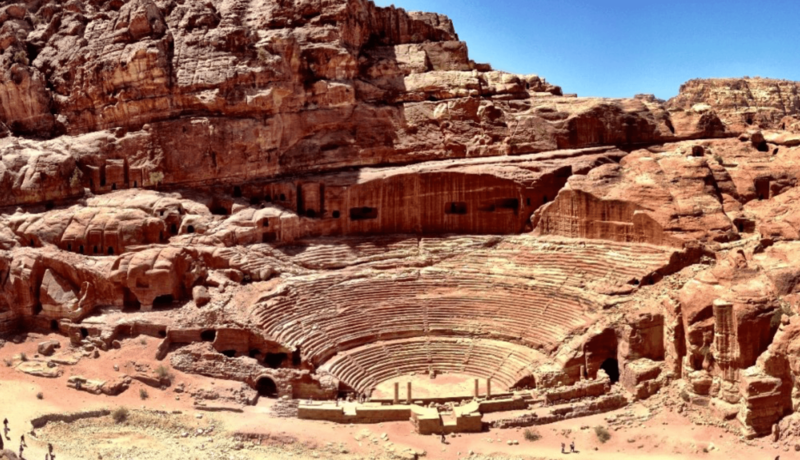 The theater was built in the cultural and political apex of the Nabataean kingdom under Aretas IV during 9 BC-40 AD. Petra suffered severe earthquakes in 336 AD which severly damanged the half of the city’s buildings and water systems. “Petra” originated from the Greek word ‘Petros’ which means “rocks”. Known also as Al-Batra in Arabic. The entrance to the city is a very narrow path about 1km wide with a cliff on each side. The structures were built from top to bottom. In the early 2000s, the exquisite site was declared one of the “Seven New Wonders of the World”. An eastern entrance to Petra known as the Siq leads directly to Al Khazneh-the treasury. It may be the greatest and breath taking feature of this heritage site, with 250-foot high (76 meter-high) sandstone carved from reddish slot canyon. For hundreds of years Jordanian city of Petra was “lost” to the Western world, until it was discovered. 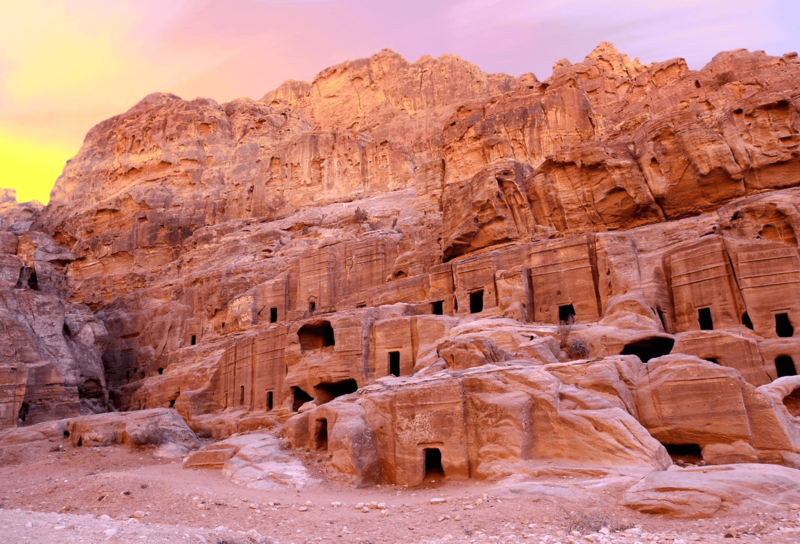 The ancient city of Petra embraces human history on an epic scale with over great mountains, wind-whittled landscapes, honeycomb tombs, and stretches across dry river beds, which is undeniably on many travellers’ bucket list. Truly an amazing sight to visit!